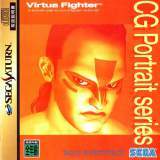 Virtua Fighter CG Portrait Series Vol.5 Wolf Hawkfield © 1995 SEGA Enterprises, Ltd. Features high resolution CG pictures and dedicated music. Released on December 08, 1995 in Japan.